E Komo Mai to the Vacation of a Lifetime on Kauai with Hula Now on the Garden Island of Kauai. Kauai embraces some of the most spectacular scenery and activities, with lush landscapes and pristine beaches that will excite all your senses with the beauty of paradise. You can explore the island from land, sea or air to experience the natural wonders and make unforgettable memories. Every experience on Kauai is a good one from relaxing on the serene beaches to exhilarating zipline adventures flying over trees tops or soaring through the lush valleys viewing the mountains tops. Kauai embraces some of the most extraordinary natural wonders, from the Napali Coast, Waimea Canyon and the Waimea River, to the small town charms of Hanapepe, Kola, Waimea, Kapaa and Hanalei. There are a wide range of choices from Beaches, Land Activites, Water Activities, or Air. Come explore the beaches, jungles, waterfalls and more. Kauai has more (more than 60) than any other Hawaiian island. Even on weekends and holidays, most beaches are uncrowded. Try Tunnels Beach on the north shore for snorkeling, Anini Beach for puka shells collecting or Barking Sands for squeaky sands and wide open beaches to explore. Visitors are often surprised to learn that the island of Kauai has a mayor for the entire island and that cities and towns on Kaua`i do not have individual mayors. North Shore: Explore the dramatic natural beauty of the North Shore from Hanaeli to the enchanting Napali Coast from lush taro fields, pristine beaches and extradoniary sea cliffs. It is home to Kauai`s premier golf courses. East Coast: Enjoy the Coconut Coast with groves of coconut palms and visit Kapaa Town. The town of Kapaa on Kauai has been named one of "Americas Prettiest Towns" by Forbes Magazine. It is the only town in Hawaii to make their list. Take a bike ride on the bike path, shopping for fine art, jewelry or arrange for water skiing or kayak rentals. South Shore: Some of the top attractions are the beautiful beaches and Spouting Horn, a blow hole releasing a spout of water up to 20 feet into the air. Explore charming boutiques and dine on Pacific Rim cuisine. Be sure to stop at Old Koloa Town rooted in its plantation past. Koloa opened its first sugar mill in 1835 and set the precedent for commercial sugar production across the Hawaiian islands. West Side: The Grand Canyon of the Pacific is breathtaking Waimea Canyon. Hiking Trails and scenic overlooks offer sweeping views of rugged terrain and valleys dipping more than 3,600 feet. There is nothing else in Hawaii like it. Two small towns of Waimea and Hanapepe are worth exploring. In 1778 Captain Cook first landed in the Hawaiian Islands here at Waimea Bay. 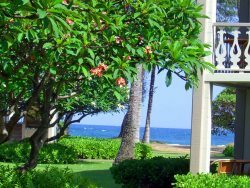 As the Garden Island, Kauai is well known for its daily farmers� markets with fresh fruit juices and smoothies, luaus, and an abundance of fresh fruits and flowers. Try some poi or shave ice or a plate lunch. Lappert�s ice cream is a real treat with flavors you will not easily find back home. Kauai coffee, rum, chocolate, and honey are not to be missed, either. Hike the natural wonder of the Grand Canyon of Kauai, Waimea Canyon; or try Captain Andy�s Catamarans to view the breathtaking Napali Coast for snorkeling, or sunset cruises and whale watching in the winter months. Kauai offers several ziplines on north and south shores from the tree tops to the valleys over the rivers in the jungle. Experience a swim with honu (our sea turtles) or relax in Queen�s bath. Kauai is the Garden Island, with beauty all around. Watch the sunset over the Napali Coast; view any number of beautiful waterfalls, including Opaeka Falls. Marvel at our red dirt. Visit Spouting Horn. Look for King Kong and a Sleeping Giant. McBryde Garden has the world�s largest collection of native Hawaiian flora. Step back in time and embrace an lauau at Smith Family Ranch with traditional Polynesian to Gaylord Plantation House. Feeling like a little romance? Take a boat ride up the river on the east side to Fern Grotto with Hawaiian dancers and musicians. Explore Captain Cook�s monument and landing site; learn the hula or how to make a lei. Tour Coco Palms Hotel and grounds and see if Elvis is in the house.